Our story begins with two car-crazed research lab co-workers poring over glowing magazine reports of a new engine that had recently powered certain white Mustang fastbacks to Super Stock stardom at the NHRA's 1968 Winternationals in Pomona, California. That engine was of course Ford's 428 Cobra Jet, which would be released for production purposes in early April of 1968. 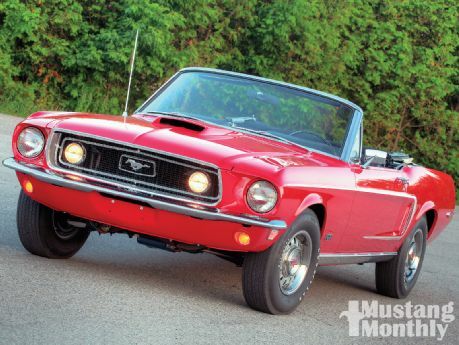 One of those gearhead lab rats-a Ford man at heart, who was doing post-doctoral research at the time-was so impressed by what he'd read that, on May 13, 1968, he signed an order form at Rankin Ford Sales in London, Ontario, Canada, for one of those newly available '681/2 Mustang CJs. On that day, 35-year-old Dr. Ross Gillman wrote out a $100 check as a deposit on the Candyapple Red convertible that he has owned ever since. Ross had gone to the dealership with the intention of ordering a four-speed car but, for some reason, Rankin Ford's performance-vehicle salesman of the era, Scott Wilson (who was actively campaigning a 427 SOHC-powered fuel dragster called "Time Machine" at the time) advised him that a C6 automatic was the only way to go. Ross did not order the 8,000-rpm tachometer that was optional on automatic CJs. Scott Wilson also suggested getting a 3.91:1 Traction-Lok rear axle in place of the CJ-standard 3.50:1 gear ratio. Ross agreed with that recommendation, but only after asking why. The salesman's reported reply was: "Are you really planning on doing 160 mph?" And Ross saw his point. Oh, and because the drag-oriented magazine articles of the day were suggesting that power steering ate up too much horsepower, he did not order it. Ross did specifically order a Parchment interior and matching white C-stripes to go with a Parchment manual convertible top (with optional glass rear window). And, because of this anticipated white trim, he also specified that the CJ's distinctive matte-black hood stripe be deleted. But when his all-powerful GT arrived two months later in mid-July, although the hood stripe was left off as requested, both its code-2A standard interior and its C-stripes were black as coal (as can be seen in Ross's circa-1970 photo). This was about the only aspect of the 335hp monster that disappointed the good doctor, who then drove his muscular ragtop daily-yup, summer and winter-for about five years. Talk about speedy house calls . . . Shortly before this, Ross had had a Sig Erson "3/4 race" cam installed in the 428 (by the original salesman/drag racer, Scott Wilson), which, he admits with a chuckle, made the ragtop's personality "a little unmanageable," so after 1973 its role went from that of daily driver to occasional toy, and by 1980 it became something of a statue on wheels, sitting outside, unused, in the Gillman driveway for about a decade before finally moving into garage storage in the early '90s. Like many classic Mustangs, Ross's Cobra Jet then endured prolonged hibernation until, one day about five years ago, one of his patients, who worked in a speed shop, came to see him with a magazine in hand. Within was an article pointing out the overall rarity of '681/2 CJ convertibles, and in particular featuring a Candyapple Red example with white top that was alleged to be the only such one in existence. (In retrospect, this claim was probably due to that car's red interior). Until then, Ross really had no idea that his old horse was of such a rare breed. He decided it was time to pay it a little attention. The first step in what would ultimately evolve into the total restoration evident on these pages was in having the performance shop where his patient worked rebuild the ragtop's 428 FE, its C6 automatic, and 9-inch rear axle, even though the Mustang had only 47,000 original miles on the odometer. That shop also totally disassembled the winter-ravaged car, even going to the extent of cutting out its rusty floorpan and sandblasting some of the unibody, but that's where they stopped, since they were a speed shop, not a restoration facility. The project then shifted to Pure Stock Auto Restorations (www.purestockauto.com) in Mt. Brydges, Ontario, where proprietor Richard Johns faced the daunting task of putting Humpty Dumpty back together again. This was complicated by the fact that, when disassembled, all of the GT's fasteners, wiring harnesses, and other small parts had simply been tossed into a large container and not in any way catalogued or tagged. Richard had all those original fasteners re-plated to the appropriate finish, and even acquired a second '68 Mustang-one that had never been apart-to verify correct fastener and wiring harness locations. SEMO Classic Mustang supplied the missing smog hardware, but all the other factory underhood components were still with the car, though nearly all were pitted or otherwise corroded and in need of cosmetic refinishing. Richard did have to chase down lots of replacement sheetmetal, including inner rockers, half the firewall, used California floors, doors, rear quarters, front fenders, and decklid, along with an NOS rear valance and headlight buckets, proving once again how hard snow-belt winters were on classic car bodywork. In the process of refinishing, he was careful to reproduce any factory markings found, including the rather large and obvious grease-pencil scribblings on the underside of the CJ's distinctive and functional hoodscoop. A carefully researched and impressively detailed rotisserie restoration ensued and, in all, Richard estimates he spent well in excess of 1,500 hours on reviving the rare ragtop. There are two departures from factory originality on Ross's R-code GT as restored. First is the substitution of the white C-stripes that he had always wanted and, second, is that yet another aftermarket cam now nestles within the convertible's original FE block-certainly nothing as radical as the long-duration Erson version installed in the early '70s, but still a bit "bumpier" than the C6OZ-625-B cam used on factory 428 CJ and 390 GT Mustangs. The scarce soft-top was absolutely fresh from the restoration process when we photographed it; in fact, Dr. Gillman's first chance behind the wheel of his better-than-new Cobra Jet came only after our images were taken. As he and his "new" old horse thundered briskly away, we realized that the intervening four-plus decades have done nothing to dampen his enthusiasm.